Kim Vlasnik is a US blogger and diabetes advocate. 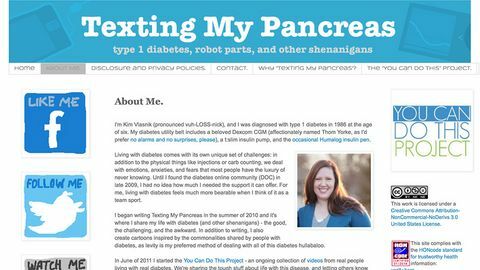 She began writing Texting My Pancreas in the summer of 2010 and it's where she shares her life with diabetes (and other shenanigans) - the good, the challenging, and the awkward, including her experiences of type 1 diabetes in pregnancy. Light humoured, well written and a wealth of experience - one personal account from the USA (where healthcare is slightly different!). Kim is great advocate for Type 1 Diabetes care and well known in the community. Her extensive blog covers all areas of life with Type 1 Diabetes and is well worth a read.